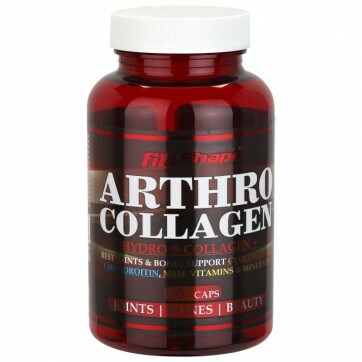 ARTHRO COLLAGEN ® is a great product for healthy bones, joints and tendons. Each athlete who has gone through a period of muscle mass gain knows that it is extremely important to have prepared bones and joints. Bodyweight or muscle mass gain leads to increased tension in bones, joints and ligaments that connect the muscle fibers to the bones. If tendons or joints of an athlete that has already gained muscle mass are not strong enough and prepared, that is a prerequisite for injuries. Healthy joints can carry more muscle mass and can withstand more tension during physical exrtion. The combination of ingredients is the best you can find on the market and the price of the product is very competitive. We have used the best calf collagen in order to help you achieve better results in a safer way. DIRECTION OF USE: Strengthens bones, joints and tendons. Take three capsules 30-45 minutes before workout and another three capsules immediately after workout. On non-workout days, take 4-6 capsules during the day. INGREDIENTS: Glucosamine sulfate, chondroitin sulfate, methyl sulfanyl methane (MSM), hydrolyzed collagen, complex of vitamins and minerals, hard gelatin capsule.